Hello humans! It's time for me to share some feline wit and wisdom with you. This is part of my ongoing efforts to educate you humans on your proper role and the correct way to interact with your feline companions. This first item is one of the posters in the "Be Prepared" series, hosted by ICanHazCheezburger.com. 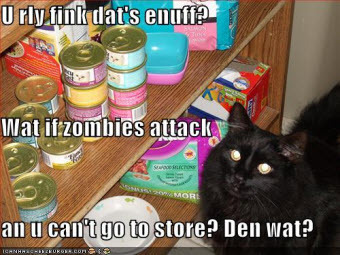 The lesson in this poster is, besides being prepared, is "You can never have too much cat food on hand". Finally, we have another video clip from the "How to train your human..." series. This is of a similar theme and will show the measures we will resort to when you humans don't feed us dinner. Again the lesson is clear - ignoring us is a stupid thing to do.